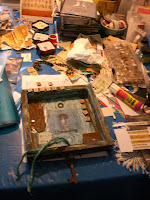 I have also continued to work on a number of collaborative projects, including one with Roxanne at River Garden Studio. Here are some glimpses at my most recent page. You can click on the details to see even more details. And...here is a peek at a piece I will be finishing any minute now. Expect a posting of the complete piece later this week. The photographs from The Pulse related to artists' collections and studios made me think of Cabinets of Curiosity. Initially created in the sixteenth century, these are encyclopedic collections and displays of objects, often scientific, unusual, and exotic. I thought I would offer more photographs of both the outside of a number of my own "cabinets" and the insides housing some of the "curiosities" as initially seen in my own photographs from The Pulse. This cabinet was found quite a number of years ago at a large outdoor flea market in NYC, which had been in an outdoor parking lot in Chelsea but has since been splintered up due to a high rise building. This cabinet, all small drawers and brass pulls, was a lucky find at the Pier Antiques Show, a twice annual show with over 500 exhibitors held on Manhattan's west side piers. An Ebay find, this watchmaker's cabinet was purchased filled with watch parts, watch faces, small glass vials, old labels, and a ton of other cool vintage bits and pieces. And speaking of Cabinets of Curiosities, there is currently an exhibit at the Museum of Modern Art called Wunderkammers: A Century of Curiosities. One amazing piece there was a large cabinet filled with all sorts of found objects. The artist is Mark Dion and the piece is entitled Rescue Archaeology. Fascinating. Thank you all for being a part of The Pulse! Thanks to the participating artists. Thanks to all the people who read through the survey posts. Thanks to all those who left comments, wrote emails, and/or posted about the project on their own blogs. And a personal thank you to all those individuals who left comments but did not leave a return email for me to write back to. The Pulse is a lot of work but I find it extremely rewarding and I am already looking forward to the next installment! If you are an artist with an online presence and would like to be a part of the next edition, please email me so I can add you to the list of participants. I am thrilled with the final result and with this ever-growing community of online artists, to which I feel a strong connection. To me this is about collaboration. About the conversation. To that end, I appreciate all the honest feedback I received about the survey and am taking each and every suggestion into consideration. 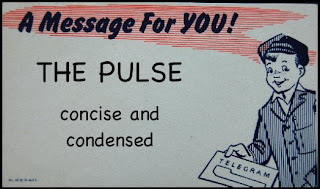 As a work in progress, you can expect a new look with every single chapter of The Pulse. But before the next chapter begins, there is unfinished business to attend to. And up first is the zine. I have decided to go ahead with a print version of the survey, which I have been working on fervently. Expect an announcement with details soon. And for those of you with fantastic memory and great attention to detail (see Sarah Fishburn's last comment on the previous post), you may have noticed that only 6 of the 7 promised questions from the artist survey were actually posted on my blog. If you want to see the 7th, you will find it only in the zine! I am not sure how consistent my postings will be over the next week or so, as I am dedicating my time to working on the zine. However, regular posts will begin again soon. Over the run of The Pulse, I have "collected" so much to show and so much to say. So stay tuned! And thank you all once again!! 7. Coffee -- even decaf works for some artists! 2. Just Do it! Enter your art space and start! According to The New York Times, the average Internet user in the United States spends more than three hours a day online. Much of this time is obviously spent on your can't live without sites! This is the same result as was found in the previous survey! Not counting the votes for The Altered Page (thank you!! 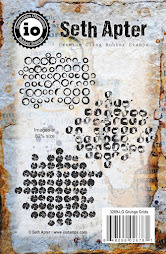 ), the #1 blog is Nina Bagley's Ornamental. Judy Wilkenfeld's Red Velvet and eb's Be...Dream...Play were close behind. And many people voted for their own site, which is completely understandable given the amount of time it takes to create and maintain a good blog! New Medium. So many techniques...so little time. When asked to share an art medium that each artist would like to explore, three techniques were clear winners. Note to instructors...these might be popular classes! 1. Encaustic. Many artists were attracted to the soft, mysterious, hazy, dreamlike, heavenly, nostalgic look of wax. And, as noted by at least one artist, it smells good too! 2. Metal. An equal number of artists wanted to try their hand at metalwork in the form of sculpture, welding, forging, assemblage, precious metal clay, silver, steel, raising & planishing, and casting in bronze. 3. Fabric and fiber. Many artists wanted to explore fabric in many different ways. 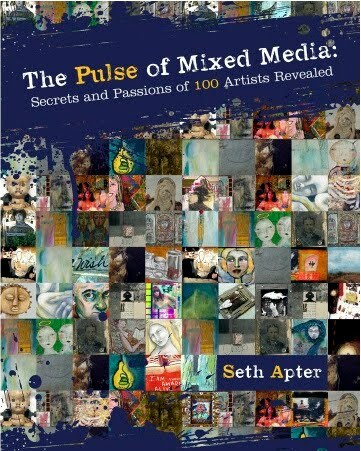 Adding it to their current mixed media arsenal was popular, but so was using it in handmade books and clothing. 4. Other techniques/approaches/materials that were mentioned by at least 5 artists included jewelry making, digital manipulation, printmaking, drawing or sketching, painting with oils or watercolors, using clay, and working BIG! The most popular descriptors include: eclectic, colourful, messy, evolving, whimsical, changing, experimental, intuitive, and organic. As for the rest of us, we might be spare, impulsive, expressive, layered, motley, textural, deep, tender, edgy, raw, realistic, passionate, polychromic, emotive, connected, light, accessible, balanced, irreverent, cartoonish, tribal, surreal, vintage, playful, intense, architectural, diversified, fun, free, quirky, precise, open, honest, dark, twisted, primitive, instinctual. 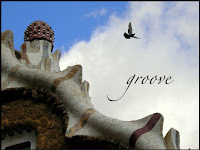 spontaneous, compulsive, minimal, thoughtful, unruly, narrative, abstract, metaphoric, evocative, and grungy! Collectors. As I expected from this question, we are a group where the majority has at least one collection that elicits passion and a tendency to hoard. In fact, many of the participating artists have multiple collections. While the items collected are as varied as our artistic styles, some themes emerged over and over again. 1. The most popular type of objects to collect, as Teesha Moore calls them, are "odd little things." 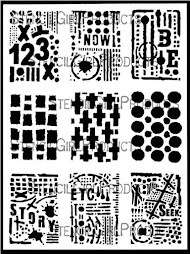 These also go by the names of metal parts, quirky stuff, door parts, ceramic bits, found objects, old things, bits of anything, junk, rusty bits and pieces, bits & bobs, and baubles. 2. 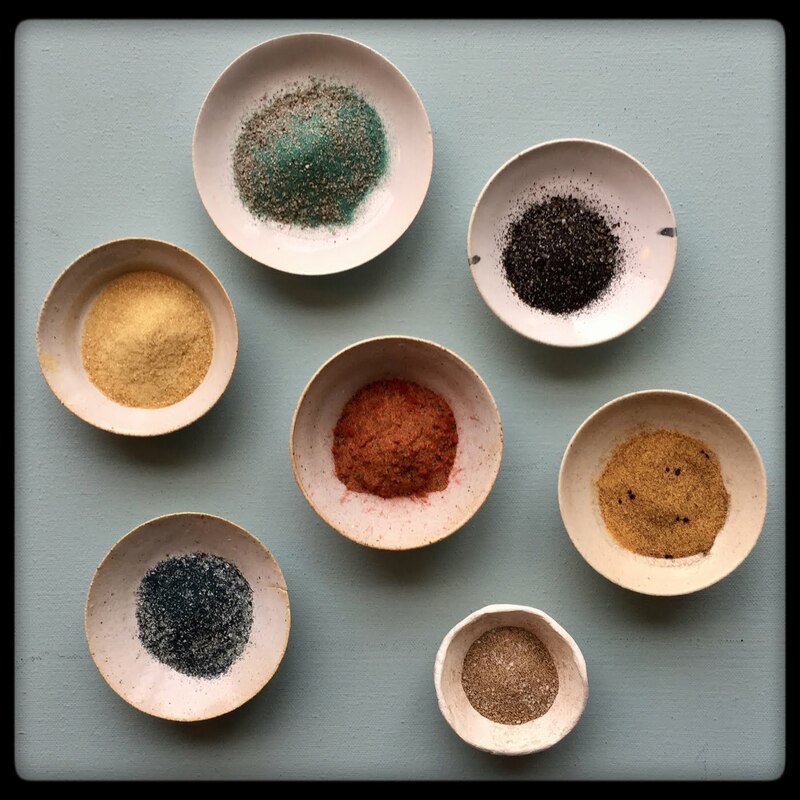 Many of us collect different materials for ingredients in our art. 3. The single most popular item seems to be rocks and stones! 4. Nature calls. Many artists collect what Debbie Mihalick calls nature's flotsam and jetsam ...bones, feathers, agate, crystal, fossils, nests, and even rock crabs (hmmmm...should those crabs be listed along with rocks and stones???). 5. Books are a popular item to collect. 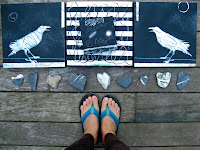 All kinds of books...handmade, art-related and non art-related, zines, magazines, and more. 6. Vintage and aged objects seemed to be coveted -- old letters, cabinet cards, vintage photographs, and things with an aged patina are just some examples. 6. Boxes and tins were also collected often. But that makes sense...there has to be somewhere to store all these collections!!! 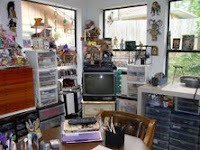 Studio Space.One thing for sure that this survey indicated: artist's can create ANYWHERE. 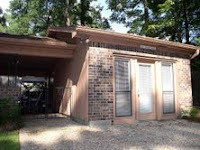 Many people have a dedicated studio at a location outside their home. 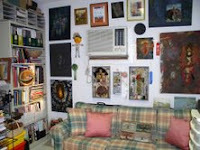 Many other artists have ingeniously carved out space somewhere in their homes. And every area counts...spare rooms, children's rooms, bedrooms, front rooms, kitchens, dining rooms, basements, attics, garages, sunrooms, patios, backyards, frontyards, under the stairs, and in the shower(!). Every surface is usable...the floor, a corner, the living room chair, the kitchen counter, a desk, the dining table, and everywhere in between. Some people work outside...in the woods, in the yard, at the park, in a bookstore, at a coffee shop. No matter where each artist works...magic happens. Welcome to the third edition of The Pulse: an artist survey. This collaborative project aims to introduce you to new artists, help you get to know familiar faces even more, and allow you access into the creative hearts and minds of a very talented crew of individuals. 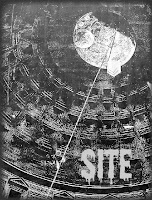 For links to the sites of the participating artists, please click here. Today's question: Where does the magic happen? Tell us about the studio, room, corner, desk, table, floor, or wall where you make art and show us one photograph which somehow captures your creative space or a work in progress. This Pulse Spotlight is brought to you by the talented, generous, sincere, and multi-faceted Sally Turlington. 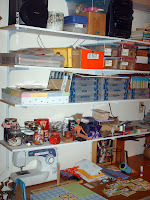 After you read this post, click here to read Sally's secret for keeping her studio in such great order. 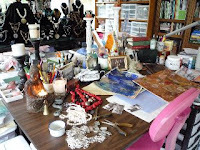 Than click here to see her unbelievable, spectacular, extraordinary, and wonderous collections that she houses in her amazing studio. And to learn more about Sally, click here to read an interesting and revealing interview. Having graduated from the dining room table to a small bedroom space, I finally have a REAL studio. 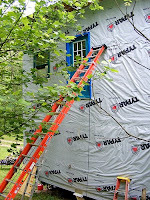 We enclosed our single car garage and added ten feet on the back with skylights, a half bath, and windows! It started out about 10 years ago really "darling" but has since completely filled with STUFF. It isn't a beautiful place - except to me - but it is quite functional. I LOVE being in there and so do my friends and family. It's magical, curious, and fun everywhere you look. My picture tour of the studio starts here --where I sit. You might be able to tell that I'm going around the room counterclockwise from this first picture. This is where the TV is in the back corner of the room. I display gifts and swaps here, too. When I look up from the table where I work -- I see this just across from me. As you can see, it is where I store lots of stuff. 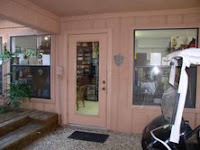 This is my main entrance to the studio from the back door of the house and across the breezeway (where the delivery guy - my sweet hubby parks his golf cart). In the little white book case are my newest art books. On top of it are the latest magazine issues. After I've read them, I file them in the new paper storage rack behide the bookcase in the nook. Here is where I have my new paper storage cabinet (old disc jockey rack), some of my rubber stamps, and for now, my golden heavy body paints. That paint rack is portable and the rubber stamp carts roll. so I can pull them where I need them. All of the tables are currently down the middle of the studio. I consider that there are three areas in the studio -- the BACK where I sit, the MIDDLE where the equipment and built in cabinets are, and the FRONT where the reading area with couch is. This is a picture down the middle of the MIDDLE section. Comprende? Just beyond the built in shelves is the front corner of the studio where I have my grandmother's old antique armoire housing supplies and bearing my doll and statue collection on top. . . fodder for collage and assemblages. 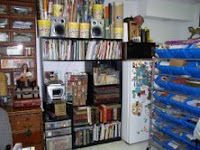 This shows the reading area bookcase with art books and back issues of magazines. At the end of the couch you can barely see a barrel of Barbie dolls for alterted art. Just on the other side of the reading bookcase, is a half bath. The door is shown closed here. 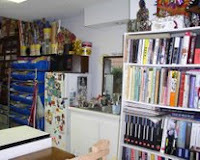 Also in this picture, you can see the three stands of magazines and books I have available for cutting up and using in collage and altered art. Here you get a glimpse of the books on the wall in the restroom. It also shows some of the equipment on the tables down the middle of the MIDDLE section of the studio: Zyron, copy machine, coil binding machine, hot press, sewing machine. And you can glimpse Iris carts under the copy machine table... there are three which have collections of dice, dominoes, compasses, small boxes, encaustic supplies, and other supplies. On the wall outside the restroom is a bookcase for my graphic art book collection and clip art books. Here is the art sink (significantly dirty and painty! ), refrigerator, and microwave. Not visable next to the sink there is a toaster oven dedicated to clay. Nothing in this room is used for food consumption except the microwave and refrigerator. (Of course, my batch of walnut ink in in the frig door - hmm, hope no one drinks it. LOL. The tall, white folding table across from the sink is on rollers and is where I stand to do work when I need a large flat area. Unfortunaltely, this area is where I've begun to stack two layers of furniture -- geeze, I hope I don't do that all the way around the studio! Yikes. This is my bin storage on rollers. I have rubber stamps and ephemera in these 21 bins. The popcorn cartons hold my decorative and handmade paper. 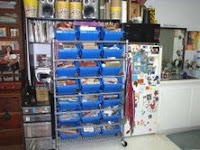 to the left of the bins is an Iris cart with my most used rubber stamps and my heat guns. Here is where you can see what's behind the bin storage . . .an entertainment center with some of my favorite jewelry-making and art books, my cd player, storage rack with my cheap acrylic paints, two shelves of old books to use in collage, and a glass front display case with my antique photo albums and a few art gifts. 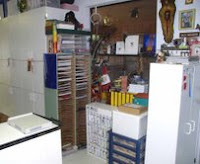 Behind the Iris cart is a cabinet where I keep a shredder, hot pots for encaustic, a light box, etc. This is how the studio looks from the street that runs along the side of our property. If you stand at the back door of our house this is the view to the studio. It is just across the small covered breezeway. Today's question: Where does the magic happen? Tell us about the studio, room,corner, desk, table, floor, or wall where you make art and show us one photograph which somehow captures your creative space or a work in progress. The following is the last of four posts to answer this question. Max Ackerson I do mostly all my work on my computer desk because I can keep all my stuff in the drawers and I can access to the net to look for art or anything that inspires me, it may be a little cluttered but it suits me perfectly. Deana Hager I have a work area set up in what we call "the stove room" (the room that houses our wood burning stove) BUT it really just "catches" things. I like to gather what supplies I need for a project and sit in the living room on my Lazy Boy reclining couch, put the foot rest up and do my thing. On a side table next to said Lazy Boy is my laptop computer. This is where I am online at all times. It makes it easier to multi task (watch tv, do art, play with my 3 year old...etc) Though my husband HATES this arrangement (he says he feels like he is married to a computer LOL or at least vying for its attention). Karen Cole Being empty nesters, my husband and I have the run of the place, yet, I chose the smallest room in the house, that's not a bathroom. I prefer containment. It keeps me focused and somewhat more organized, just because I have to be. Problem is, I work in so many different mediums, I can only work in one at a time. Sometimes I end up at the kitchen table or on the floor. What you see in the photo is one of my little corners of the world. "An artists studio should be a small space because small rooms discipline the mind and large ones distract it". -Leonardo da Vinci. 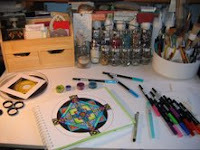 Nancy Baumiller It all happens in my room, where it is quiet and I can spread out all my supplies right on my bed and everything is within reach to create my art! Marilyn Gallas Everything happens in my 10 x 10 office/studio. 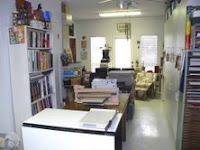 Part of the space is devoted to computer, printer, scanner, etc. The other part is devoted to all my artistic endeavors and holds all my paints, brushes, canvases, journals, ephemera, papers and who knows what else! Cynjon Noah Unfortunately, at the moment where the magic happens is VERY limited in size/space...it's a small desk in the back corner of the dining room, in a rental property down the road from our own place, that we share with several other folks. Ro Bruhn I'm very lucky I have quite a large studio that's part of the house. It's divided into three sections, my mosaic and heavy duty power tool section. 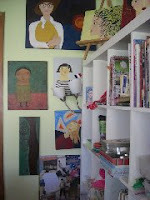 My jewellery and painting area, then my textile, fabric and altered book section. Sometimes they all combine and become one big jumble, my husband refuses to enter without wearing a hard hat. My grandchildren enter and I have trouble finding them sometimes, just kidding. Elizabeth Bunsen The magic happens anywhere and everywhere - but especially in the journal - I write and create 2 or 3 entries a day - first thing in the morning under the skylight on the round table covered with my rock collection... then walking - walking is where many an idea will take shape or envision its unfolding (and also dreaming)... then depending on the weather I go into the spacious town studio and make creative messes and/or take up my office hours at the beach and journal as I practice deep listening. I feel as if I am always "documenting" my life and experience - and this better describes what I do now more appropriately than "making art". Steph Brouwers The magic can happen in different places .... my bench, the floor, the garage, outside... When I make jewelry, I like to use this old anvil and this old vice... they give a bit of their souls to my jewelry. 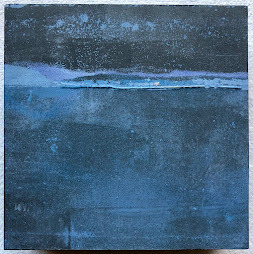 Bridgette Guerzon Mills I just made a huge move from Seattle to Chicago and am working on setting up my studio right now. It is a huge undertaking! I feel like I really must have everything just so and have everything organized. I just cannot create in chaos. And right now my studio is chaos. So instead of showing a picture of that, I am sharing a picture of a wall I had dedicated in my old studio as the "Art Wall". I was preparing for my first solo show and I used that wall to hang up pieces as I finished them. 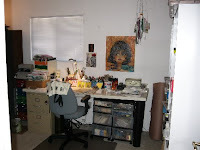 I had a very small studio space at the time and you can see the easel to the left, the art table to the right and a little easel on the table. I used every available space I had! David Castle Earlier this summer I purchased and opened my own studio space in Denver’s Santa Fe Arts District. This was an 8-month project and I am thrilled to finally be in my own (air-conditioned!) space for creating. It’s a rather small floor space, but I have external windows and 18 foot ceilings, so it feels big enough and perfect for creating. Valerie Foster Well, perhaps there's some magic in my art, but there is NO magic in my art room. It's a total mess, due to being very small, and having waaaaay too much art "STUFF" to fit into it. I'm sooo not proud of my art room, and find it amazing that I can actually get any art done at all in it. In fact I often think it has a detrimental affect on my art, or at least my mood. Sometimes I'm in the mood to do art, and walk into my messy, cramped room, and get so discouraged, I walk right out again, and go do something else. 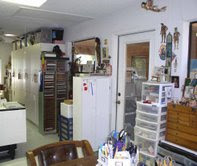 So no, my art room is not magical at all, and I'd prefer not to submit a picture of it. It would be too embarrassing for me. Paul Sears As much as possible, all the magic happens in-camera. Or I should say the magic happens in the outside world. I just try to get out and soak in as much diverse experience as possible, and look for killer moments when I'm out. Gina Petterson I have a room that i never seem to be able to work in because it is so crowded, all of the little embellishments, books and paints want to speak at the same time. I will try and disconnect by going on line and hop back and forth between my desk and my chair until I can get a fix on the direction I want to go in. There are not too many altered artists here in Sweden, especially in my small area where I haven't met anyone yet. 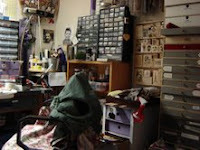 Kathleen Botsford My messy studio. ( I confiscated the sunroom from my children about 5 or 6 years ago.) It was much neater when it was a playroom for them! Sarah Whitmire My whole house is pretty much overrun with finished and unfinished art, art that has been sold and art that needs to be packaged up for one reason or another. I have two main work stations though. My main area is my office/studio where my desk and computer is. I do the majority of my projects here. 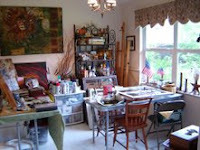 I also have my kitchen area which holds overflow paints, fabrics, found objects, finished work for sale and is also home to my largest Easel and long work table for when I want to work on bigger projects. Joanna Olson This room is an extension of my kitchen (I'd given up thinking I'd ever use it for actually eating out of. It's a lovely light room full of the things I love having around me. (I do anything that requires noise or the use of a torch in the basement). My computer is in the far corner and is where I start my day (after watching my design shows on cable TV, I'm only moderately ashamed to admit). 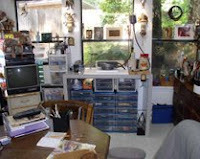 As you can see the table in the foreground is my jewellery (Canadian spelling) worktable, smack dab in the middle of my easel and paint supply table which moves around the room depending on where the sun is (or isn't). Something I'm missing is a really good large table to put watercolor sheets onto. In that case I cover the dining room table and prep backgrounds and anything that requires broad sweeping brush strokes. Once the painting is underway and the work becomes tighter I can paint in this more restrained area. 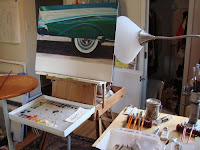 Larger works in oils or acrylics are not so much of a problem because they are upright in an easel. And then I enjoy baking too, my other creative outlet so this room really works for me. Lisa Dalke We have an art room in the middle of the house. I say we because all are always welcome to come and art with Lisa. 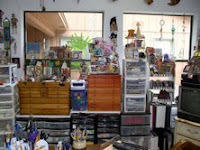 The room is surrounded by windows, music, animals, junk food, coffee and lots and lots of art supplies. Trudi Sissons I set up my garage studio beginning with a broken door set on two old trunks next to my family’s old dining room table, With the overhead door wide open, I have natural light and fresh air for 8 out of 12 months. I am almost always humming to music and bird watching. It’s almost packed to the rafters now. I dream of a larger studio with an enormous table, wide wooden planked floors, white washed open beams and floor to ceiling windows. I know it’s waiting for me. 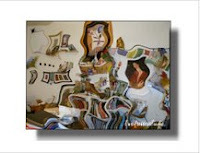 Doreen Grozinger When my son moved out, I claimed his bedroom as my art room. I built him a platform bed which has conveniently become a large work space for me. I have one main area I sit at to work and try to keep it maintained, free of clutter, which is pretty challenging. The large table tends to be the collection area, with half-started, incomplete projects. I also have a meditation and journal area I work. Here I may pull an inspirational card, and journal or draw in my response to it. Roxanne Stout My studio is a sun room with lighting that comes in from three directions; the north, east and west. From the windows in the summer months I look out over a flower garden and lush trees in many shades of green. During the winter months I look out on to the Klamath River and watch the ever-changing sky through the sculptural branches of the now bare trees. This is a wonderful "nest" for me because from here I can watch the flights of thousands of birds that migrate along the Pacific Flyway and rest on our river and refuges. I work on a round oak, pedestal table. I get paint on it often, and it is getting pretty beat up. This table gets really messy. 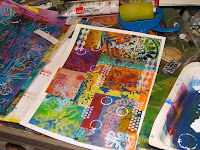 Sometimes, like now, I have to spread out over other tables and shelves, especially if I am using acrylics or making collages. 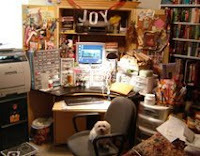 This is a shot of my work space. I usually have everything spread out, leaving only a small area to work in. On the bottom right hand corner is the beginning of my newest project called "rejoice." The two pictures on the left are my first two of a series " the timeless woman," from photographs I took in france this summer. 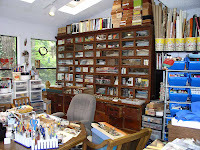 Seth Apter My work space is filled with large and small cabinets, boxes, and drawers. These in turn are filled with art supplies, paper, found objects, ephemera, rubber stamps, and other assorted artistic flotsam and jetsam. Being surrounded by these objects always gives me inspiration.